For the second time in five years, state courts have rejected attempts by the California Public Employees Relations Board to sharply expand the sweep and power of state collective bargaining laws. 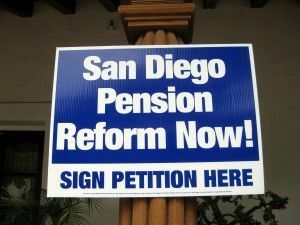 Last week, a three-judge panel of the fourth state appellate court district unanimously rejected a 2015 PERB ruling that if upheld would have invalidated a successful 2012 San Diego ballot measure that gave newly hired city employees – except for police officers – 401(k)-style retirement benefits instead of defined-benefit pensions. The measure was meant to dig California’s second-biggest city out of a hole created by two City Council decisions to intentionally underfund the San Diego pension system, leading to a city fiscal crisis so severe that San Diego was dubbed “Enron-by-the-Sea” in 2004 by the New York Times. PERB’s ruling was based on the view that any pension ballot measure that was promoted by elected city officials – in San Diego’s case, by then-Mayor Jerry Sanders and several City Council members – ran afoul of state requirements that local governments had to negotiate in the standard collective bargaining “meet and confer” process before they could change terms of employment. This legal argument was tough to square with California’s history. Elected officials frequently have taken the lead in employing direct democracy to adopt new laws or modify existing ones – including those that affect terms of employment for public employees. In 2005, for example, Gov. Arnold Schwarzenegger sought to change teacher tenure rules in a special election. Schwarzenegger couldn’t sell the change to voters, but his attempt to do so was not seen as unlawful or unusual. The appellate panel agreed with the city of San Diego’s argument that while elected officials helped lobby for the 2012 pension reform measure, it was crafted and placed on the ballot in keeping with standard practices for citizens’ initiatives, with petition committees, signature-gathering campaigns and other normal trappings of direct democracy. The ruling also noted that PERB had tried to use its official powers to block the ballot measure in early 2012 even before it reached the ballot, with the hint that appellate judges saw this decision as a sign of PERB abusing its authority. PERB’s previous setback in asserting the sweeping powers of collective bargaining laws came in its response to a lawsuit filed in 2011. Parent activists sued the Los Angeles Unified School District for not considering student performance when formally evaluating teachers, as is required by the Stull Act, a far-reaching state education blueprint enacted in 1971. PERB contended that before teachers were subject to such evaluations, the matter should be collectively bargained – even though the primary law establishing collective bargaining for teachers was approved in 1975, four years after the Stull Act took effect. The agency also held that it should have initial jurisdiction over the case – not state courts. But Los Angeles Superior Court Judge James C. Chalfant’s 2012 decision categorically rejected PERB’s arguments, saying that LAUSD could not ignore the Stull Act’s requirements, that collective bargaining did not apply retroactively to older state laws and that parent activists were free to use the courts to challenge whether public schools were complying with state laws. The Stull Act remains an area of contention for California public schools despite Chalfant’s ruling. In September, Contra County Superior Court Judge Barry P. Good rejected a lawsuit that said 13 Northern California school districts were breaking state law by refusing to consider student performance in evaluating teachers. Good’s 40-page ruling held that the Stull Act’s requirements were not as “clear and unambiguous” as those who filed the lawsuit contended.